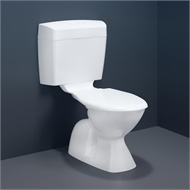 The Uniset II is a mid-sized, modern styled cistern designed for retrofit installations. This versatile 6/3 litre dual flush cistern can be converted to 4.5/3 and 9/4.5 litre with the benefit that the matched suites are suitable for multi-purpose applications and can be used where authorised for septic installations. 10 Years Replacement, 1 Year Parts and Labour.